After a full evaluation of my eyelid problem, he operated on me a few weeks ago. Incredible results, I regret not having operated before. Dr. Cecilia Rodríguez Luna is an ophthalmologist and oculoplastic surgeon, expert in aesthetic and reconstructive surgery of eyelids, lacrimal and orbit. He completed the specialty of Ophthalmology at the National Hospital of Clinics, National University of Buenos Aires, Argentina (2006). Later he performed in the same hospital the Fellowship of Oculoplastic Surgery, Orbit and Lacrimal Tract (2007) by the prestigious Professor Dr. Daniel Weil. 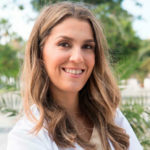 In the 2008 year she moved to Las Palmas de Gran Canaria and during 5 years (2009-2014) she worked as Head of the Oculoplasty Unit, Lacrimal Pathways and Orbit in the Gran Canaria Ophthalmology Clinic. Always at the forefront and in the search to improve the care of his patients, in the year 2012 obtained the Master in Aesthetic Medicine at the Juan Carlos University, Madrid, Spain. Currently, the doctor works in both Las Palmas de Gran Canaria and Tenerife. Expert in blepharoplasty and aesthetics of the look. Due to her extensive experience, the doctor receives complex cases derived from other specialists. Is there any ophthalmological treatment for dark circles? Why the dark circles appear and how can they be eliminated?